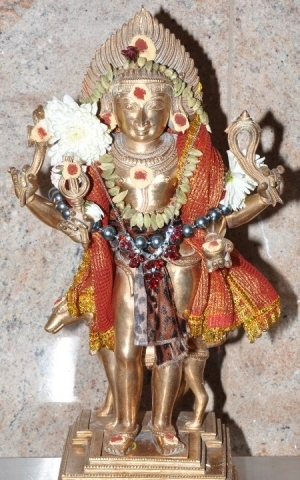 Swarna Bhairavar, is generally given the role of the custodian of the Temple. In traditional Temples, He is symbolically given the keys of the Temple after the Temple has been locked for the day and the keys are placed for a moment in His hands symbolically giving him the duty of guarding the Temple until the doors open next morning. His divine vehicle is a watch dog. He is another aspect of Šri Šiva – portrayed as the guardian of the world.